The first time I ever heard that Joseph Smith translated the Book of Mormon by looking at a rock in a hat was in a South Park episode. That was years before my disaffection, and it seemed strange, but I didn’t think about it much. I also wasn’t sure if it was true, because South Park isn’t normally something you would use to learn about the LDS church. Then I found the LDS essay “Book of Mormon Translation” and it turned out South Park got it right, at least on that detail. 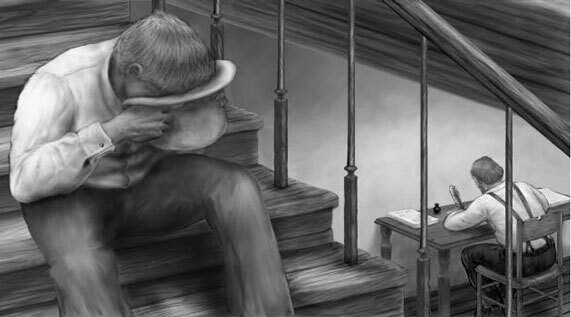 From the LDS.org essay: “According to these accounts, Joseph placed either the interpreters or the seer stone in a hat, pressed his face into the hat to block out extraneous light, and read aloud the English words that appeared on the instrument.” As FairMormon admits, Joseph Smith used the same seer stone to translate the Book of Mormon that he used earlier in his life to try to find buried treasure. No treasure was ever found with the seer stone, but it somehow worked while translating the gold plates. Why Were the Plates Even Needed? Why did the Nephites meticulously carve engravings into gold plates if they weren’t used at all in the translation? 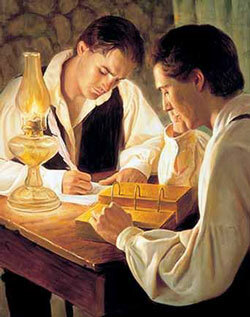 Why does the LDS church choose to show depictions of Joseph Smith studiously looking at the plates while translating when they know he didn’t? The picture above is found in the “Preach My Gospel” manual, which missionaries use to learn to teach about the church. Instead of using a misleading picture, why not show something accurate? And if the truth is too embarrassing, don’t use a picture at all.